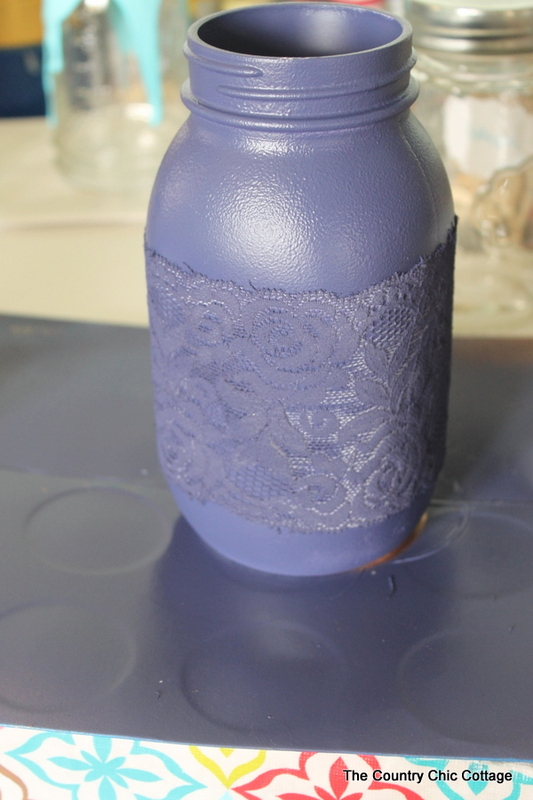 Y’all this lace mason jar vase is just paint! There is not any lace wrapped around it in the picture below. Amazing right? This will be simply gorgeous for weddings. 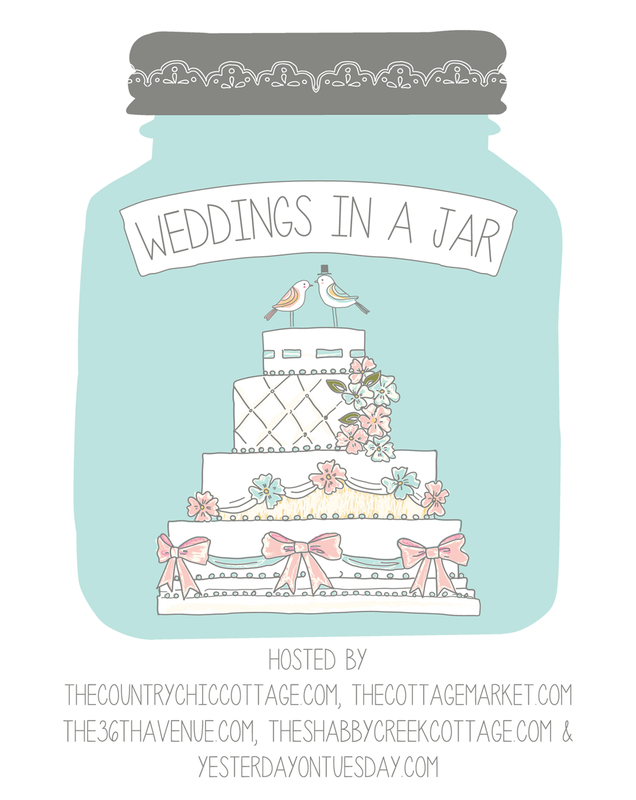 This is the second in a week of mason jar wedding ideas. Be sure to scroll to the bottom of this page and click around for even more ideas from my partners for this series. This post is a part of my design team status with DecoArt so I am compensated for my participation. All opinions are my own. The links below are affiliate links and I will receive a small portion of each sale. 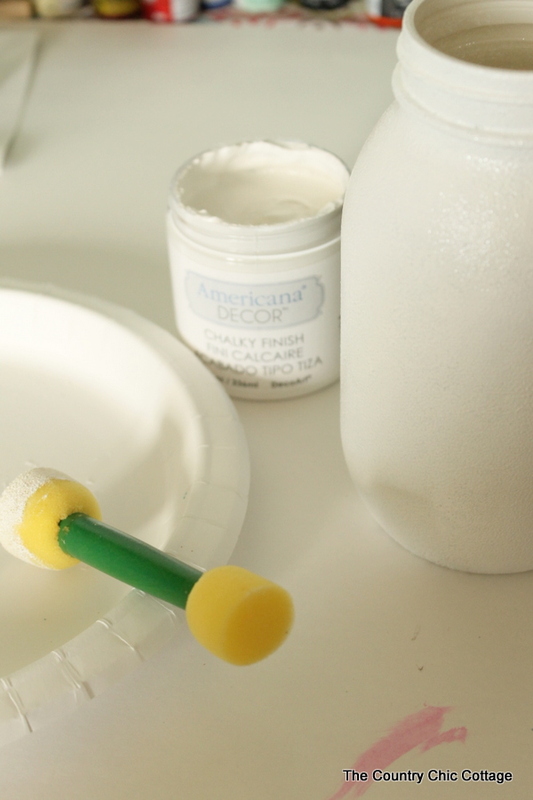 Paint your entire jar with the DecoArt Chalky Finish paint. I used a poucer brush to avoid any brush marks. One or two coats should work for complete coverage. Be sure to allow to dry in between coats and completely before continuing to the next step. 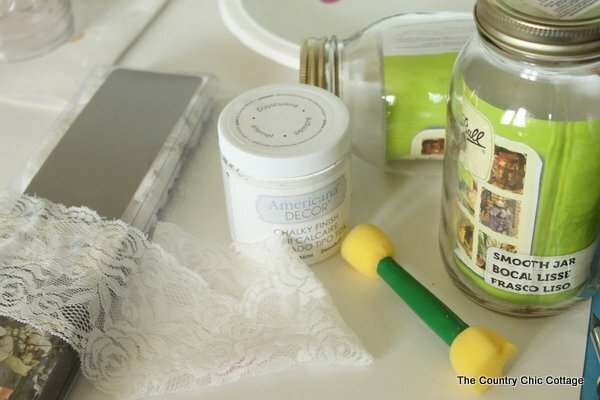 Wrap the jar with the lace ribbon and secure with a little hot glue. You want the ribbon to be tight and secure but come off easily later. I just used the hot glue to secure the ribbon to itself and not the jar. 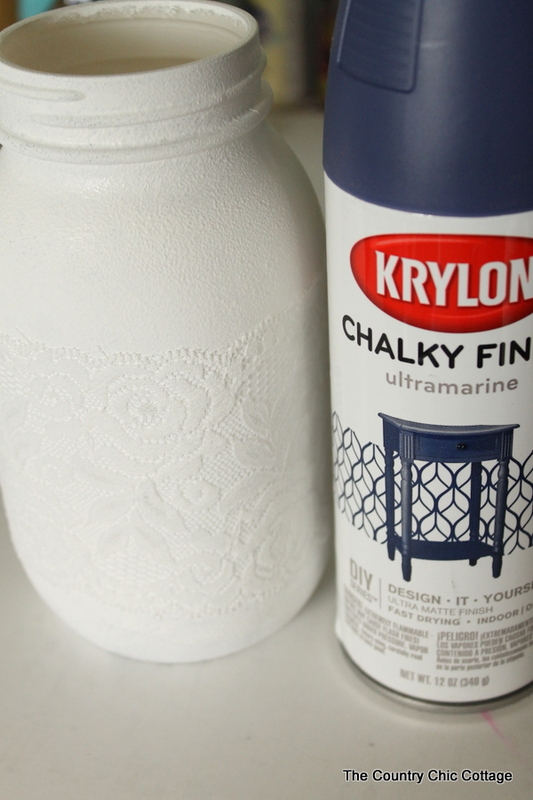 Spray right over the top with the Krylon chalky finish paint. A few light coats will get complete coverage. Allow to dry to the touch then remove the ribbon. Removing it is like MAGIC!! It is not there but it appears to be! 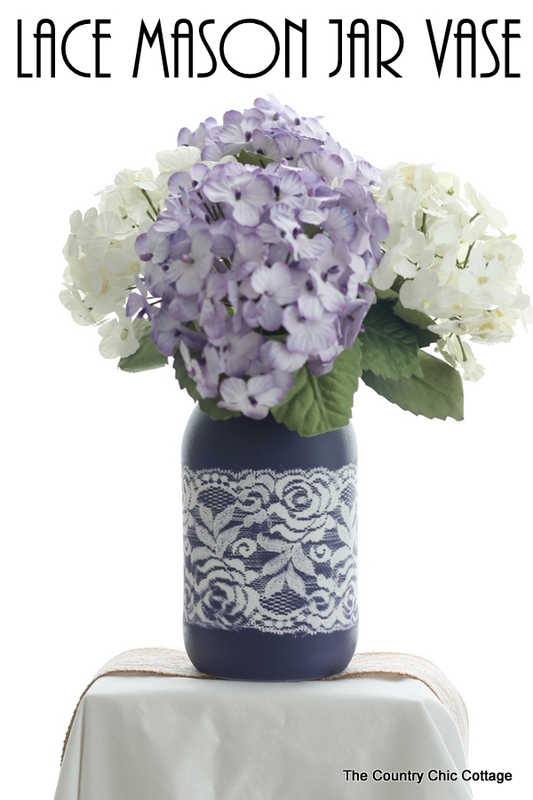 It is absolutely a gorgeous mason jar vase for weddings. Plus it is so simple to make! 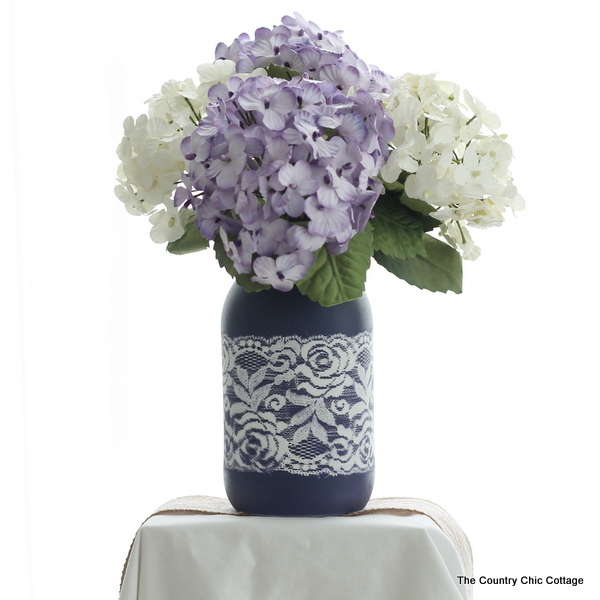 NOTE: You should be able to reuse the lace again and again for multiple vases. All that is left is to add in some paper hydrangeas and set your wedding tables! 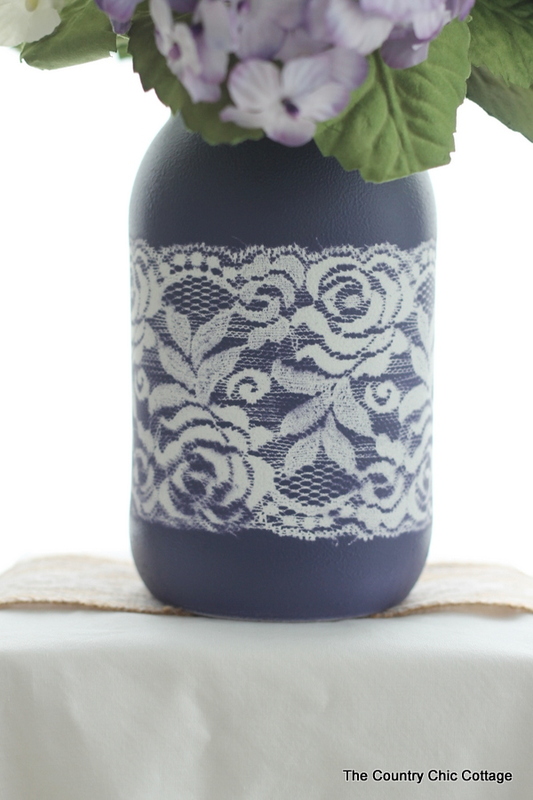 This lace mason jar vase is simple enough that you can make several for your wedding in no time. Choose the colors to match your wedding and set aside a few hours to make a dozen or more! I promised y’all some more mason jar wedding ideas! Here are links to the blogs that are joining me this week. Y’all don’t miss any of the ideas! Wow this is amazing Angie! I totally thought the lace was a ribbon until I read your post. Beautiful! Your vase and flowers are lovely. Hope I can find the materials to make some like yours.